[Update]: After a month of testing and 19 beta releases, BiteSMS 8.0 is officially released for public. You can also get BiteSMS 8.1 from the test link shared in this post. BiteSMS iOS 7 jailbreak tweak is becoming popular among jailbreaking community looking for introducing some changes in the native Messages app. From quick reply and compose links to various other additions make BiteSMS quite a sought-after tweak for those who have a jailbroken device. BiteSMS has the similar iOS 7’s neat and clean look. Replacing the native app, BiteSMS iOS 7 is loads better than the native app’s functionality. 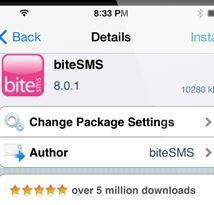 Some jailbreakers even go ahead to say that Apple should consider stuffing the native Messages app with features found in BiteSMS. The best thing is that BiteSMS iOS 7 doesn’t replaces or deviates from the native look and feel of iOS 7. On the functionality part, BiteSMS iOS 7 messages tweak lets you directly respond to messages from the Notification Center and the lock screen. You can get BiteSMS iOS 7 from Cydia from this repo link: test-cydia.bitesms.com. To add a new repo, go to Cydia > Manage > Sources > tap on Edit > and finally tap on Add to add the repo and get the tweak.